Khios and the coast of Turkey from Candarli to Doganbey Ad. Scale: 1 : 187.500. Larger scale plans of Limin Khiou (N. Khios). Cesme Korfezi (Turkey), Sigacik Limani (Turkey), Limin Psarou (N. Psara), Foca Limani (Turkey) and O.Mandraki (N. Oinoussa). 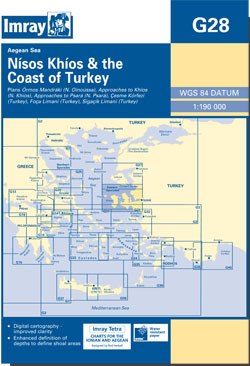 On this 2013 edition full details of the new TSS schemes are shown at Izmir Körfezi, Çandarli Körfezi and Nemrut Koyu, revised depths and harbour developments are shown at Psará, Khíos, Çesme and Foça, the Sigaçik Limani sketch plan has been replaced with a fully WGS84-compatible version, the latest known depths, restricted areas and marine farms have been applied to the main chart, and details of the recently deployed AIS transmitters are shown across the chart.